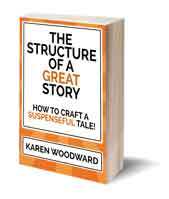 Karen Woodward: What Do Aaron Sorkin, Stealing, And Advice About Writing Have In Common? What Do Aaron Sorkin, Stealing, And Advice About Writing Have In Common? 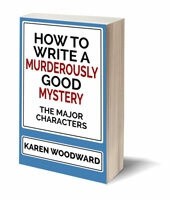 "Good writers borrow from other writers. Great writers steal from them outright," Aaron Sorkin. Yesterday Gwen sent me a clip of Aaron Sorkin's cameo appearance on 30 Rock where he pokes fun at himself, at his quirks. After I watched the clip I thought, 'Huh, I wonder if Aaron Sorkin has written anything about the art of writing?' And, guess what? He has! In How to Write an Aaron Sorkin Script, by Aaron Sorkin Mr. Sorkin gives advice about how to introduce crucial (but possibly boring) information and make it all seem interesting and clever rather than contrived and boring. BUT, before I get to that, I'd like to talk about stealing. And by "stealing" I don't mean plagiarism—which is bad, very bad—but the sort of outright stealing Aaron Sorkin was talking about in the quote at the beginning of this article. So, plagiarism is nasty while 'creative stealing' or modelling, is perfectly fine. The other day someone compared modelling to the way a musician learns to play an instrument. They play a song someone else wrote over and over again until they get it right, then move on to another song. This is the writer's version of that. I'll leave you to read Elise's wonderful article, but I would like to share her #2 way of stealing. [A] way you can model is to use a setting from popular literature. A song in a musical works best when a character has to sing—when words won't do the trick anymore. The same idea applies to a long speech in a play or a movie or on television. You want to force the character out of a conversational pattern. In the pilot of The Newsroom, a new series for HBO, TV news anchor Will McAvoy (Jeff Daniels) emotionally checked out years ago, and now he's sitting on a college panel, hearing the same shouting match between right and left he's been hearing forever, and the arguments have become noise. A student asks what makes America the world's greatest country, and Will dodges the question with glib answers. But the moderator keeps needling him until...snap. And then comes a fact-dump/information dump, but it works and it's interesting. In his article Aaron Sorkin demonstrates what he means by giving a short scene with commentary both about the effect he wants his words to create in the audience and how he creates that effect. It reminds me of a magician giving away one of his tricks. A wonderful read. Who is your favorite author to model? Is there anyone you're currently modelling? 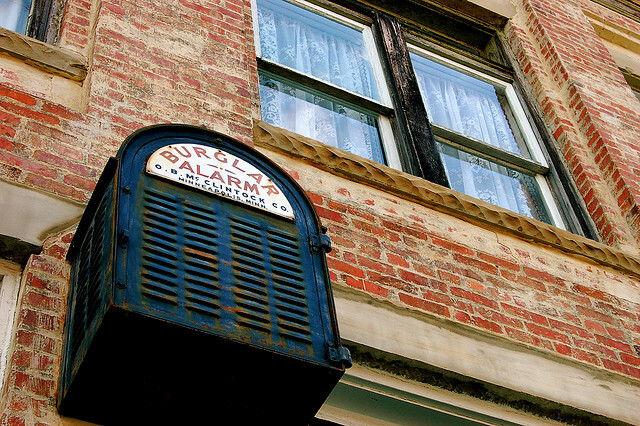 Photo credit: "Burglar Alarm Box" by taberandrew by Creative Commons Attribution 2.0. It's interesting how Picasso said something similar, "Good artists borrow, great artists steal." I've never really understood that, and doubt I ever will, but then I'm still dwelling on what is an original idea . . . little picture stuff. Well, it's kind of like how, in Philosophy, some say that everything is a footnote to Plato. That idea. Think of how many times Shakespeare has been 'modeled'. That Sorkin article is fantastic. Thanks for sharing it. It really is one of the best pieces on writing that I've ever read. Thanks John! Yes, it's great when a pro breaks down how he does it. Love the article. As a musician and composer, I concur that modelling is what so called stealing is. With music, timing can shift ever so slight and accents etc, thereby making it your own. I love how aware Sorkin is of the structure of the "music" he is creating through the dialogue. Thanks Andrew! Love the music analogy. Thank you so much for your kind words about my blog post, Karen.